Wednesday: A 30 percent chance of showers and thunderstorms, mainly after 1pm. Partly sunny, with a high near 90. Calm wind. Wednesday Night: A 20 percent chance of showers and thunderstorms before 1am. Partly cloudy, with a low around 73. Calm wind. Thursday: A 50 percent chance of showers and thunderstorms after 1pm. Partly sunny, with a high near 90. Calm wind becoming northeast around 5 mph. Thursday Night: A 20 percent chance of showers and thunderstorms before 1am. Mostly cloudy, with a low around 73. Calm wind. Friday: A 40 percent chance of showers and thunderstorms after 1pm. Partly sunny, with a high near 91. Calm wind becoming north around 5 mph. Friday Night: Partly cloudy, with a low around 73. West wind around 5 mph. Saturday: A 20 percent chance of showers and thunderstorms. Mostly sunny, with a high near 92. Northwest wind around 5 mph. Saturday Night: Mostly clear, with a low around 72. Northwest wind around 5 mph. Sunday: Sunny, with a high near 91. Sunday Night: Mostly clear, with a low around 71. Monday: A 20 percent chance of showers and thunderstorms. Mostly sunny, with a high near 90. Monday Night: Mostly clear, with a low around 71. Tuesday: A 20 percent chance of showers and thunderstorms. Mostly sunny, with a high near 90. 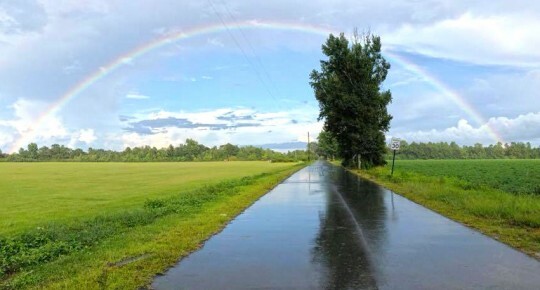 Pictured: A rainbow over Bradberry Road in Bratt. Photo by Sheena Carach for NorthEscambia.com, click to enlarge.